Kids, Cows and Grass: What do you want to know? I'm a cattle rancher--I love my job. I love my life....well, my job is my life! Along with raising five kids (and a husband) my life is raising cattle. Recently, I've had some questions posed to me about why I do what it is that I do. And I can honestly respond that I love living in the country, near a small town, raising my kids on hard work and responsibility, and caring for the land and the animals. These questions made me realize (yet again) that there are so many people who can't get to visit a farm or ranch, but who want to know what happens on one. For various reasons, people want to know how their food is raised. I'm happy to answer those questions...if I can! I admit, I'm not a beef processor, not a feedlot operator, and not an engineer. I'm a rancher. My daily life is taking care of cattle...but what does that really mean? 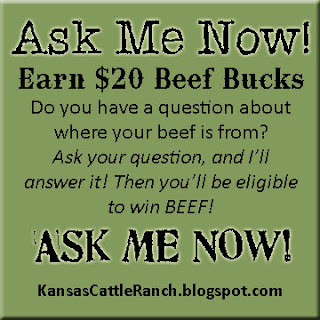 So, if you have a question that you really want answered about life on a ranch, post it here! I will answer it, or I will find someone who can. Okay, yes, this is an old pic!! I know, I know. As the saying goes, there is no such thing as a stupid question...that is absolutely true with me! I have no idea what a geophysicist does, or what conditions a steel mill worker endures. The only way I can learn about those jobs is to ask someone who really does that job. So, I won't judge your question...I'll just do my best to answer it! That is an intresting statement..."my job is my life". My question to you please(and I'm not being smart)is what happens if you lose your job? Thanks; Marc. Very interesting question, Marc...and I picked it up at an interesting time. I was standing in the middle of 92 heifers at 7:15 am sipping my homemade latte and watching to see which heifers are in heat! Not what many people want to do before breakfast, but it is perfect for me! The great thing about my job is that I am the boss, the owner, the custodian and the daily labor...in other words, it is up to me if I have a job or not. Now, what happens if the bottom falls out of the cattle market and I can't make enough to pay for my family? I will sell cows and look at the other ag markets and raise something else until the cattle market rebounds...as it always does! The bottom line...I'm in charge! My heart breaks for those farmers and ranchers who can't keep doing what they love. It is truly a lifestyle for us--not just a job. I hope that you found some other way to stay involved in agriculture and that you are happy now, as well. Thanks for your comments. Yes, most people do not realize how the 'job' is also a lifestyle. It is who we are. Our identity as an individual, as a person, and as a family. My kids just love the farm.. My hubby is working long hours on a neighboring mega farm and we never see him anymore. We are doing small direct to consumer marketing, but we are just transitioning, we havent been able to find a suitable farm and feed cost/pasture rent is kiling us. If it werent for the kids I dont know what we would do. We are trying to hang on for them too. They are trying to build up their own herds. We are looking out of state for a small farm/ranch and work. NY is not very friendly. I am happy for you that you get to do what you love. I'm happy to you are trying to hang on...I totally understand the cost of doing business is growing so fast! Most people have no idea what a tractor costs, or an acre of land...and how many cattle an acre of grass will feed. I hope you can find a way to stay in farming. It is a great life! I just found your blog and am having so muh fun reading through it. My husband and I have a beef cattle operation in PA and I am a stay at home mom of two little boys (4 and 2 years). I feel priveleged to be the one to care for our cattle while my husband is away at his "day job" as a tractor salesman. I love driving tractor and making hay with our kids during the summer and teaching "consumers" about where their meat comes from! When your children were little how did you keep them occupied and out of trouble while you were doing farm chores. I am soon going to run out of room in the tractor and skid loader cabs! Jessica, I had tractors with buddy seats and I was able to have them with me most of the time...but, remember, I had five little little kids at the same time, so they could entertain each other! I also made use of playpens, swings in the barn, strollers and back packs to keep my kids with me safe and occupied. Like Debbies,they also had each other to entertain. Busy days, but oh so fun! do all your children plan to go into ranching? I wish I knew the answer to this question, Ellie. I hope that a couple will actually be ranchers, but I think they will all be involved in agriculture in some way. I have two girls in college--one in Ag Econ, and the other is in Hotel & Restaurant Management. My son will start college in the fall in the college of ag in Wildlife and Outdoor Enterprise Management. We'll see where they all end up--but until then, I am proud to have raised them working on the ranch with me. Hi, I just found your blog and love it. I'm 38 years old and just moved out of the suburbs of St. Louis last year - now I'm in a more rural area, and love "living in the country". I still drive into the city for work every day, but I get to go home to a log cabin on three acres, and my next door neighbors are cows. The cows intrigue me - I have never been around them before now, and I'm very curious about them. I've written a bit about cows on my blog: http://www.dogfostermom.com/search?q=cows and it's pretty obvious I'm clueless when it comes to cows. :-) So I guess my question for you will be... next time I see a cow in the middle of the road, what should I do? Thanks for your link! I enjoyed your post!! This is the first time I've been asked this question...and it is GREAT! My suggestion is to first get to know the owner of the cows that live near you. That way you can call them if you see a critter out of the fence. And if you do happen to meet one on the road, slow down...cars and the sounds they make might spook a cow, but they probably won't chase you. I imagine the reason they chased you the time you took the photo was because of your dog. They perceive dogs as predators and need to protect their babies. So they chase them. If you are in a car, slow down and let the cow get off the road, or pass them slowly on the side. Then call the owner and let them know! If you are walking and a cow is out on the road, AND you have your dog with you--turn around and go the other way!! But if you are alone, you are probably safe and you can "shoo" them off the road by raising your arms and saying "HEY, get off the road silly gal!!" That's what I do anyway! In the country there are many opportunities to meet critters on the road--both tame and wild. A cow is not like a deer and isn't fast and spooky like that, but if you hit it with your car it will make a very big dent--or worse. So be cautious this time of year when grass is green along the roadsides--they seem to think that they must eat this grass, too. Be safe! And thanks for the question! This is probably too late for a response, but I've been trying to learn more about what routine health checks entail, especially during late winter/calving season, but mostly in regards to how they serve as an alternative to scorched-earth antibiotics. 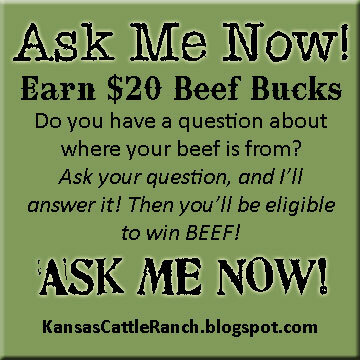 It is hard to tell from your question if you are a rancher or you just want to know. I infer from your reference to "scorched-earth antibiotics" that you are not a fan of antibiotics. I will tell you that late winter/calving season is not a typical time for cows to get sick! We rarely need to feed antibiotics or treat any cows at that time. The typical time for cows in the Flint Hills of Kansas to get sick is late summer when the ticks are biting, flies are biting, heat is strong and the calves are big. We do a herd health check at that time while we are pregnancy checking. But every week I am looking at all of our cows on a rotational basis (at least one pasture a day--we have 10 or so pastures) and walking through the cows looking for signs of anaplamosis or footrot or pinkeye. All of those conditions are common this time of year. They all require antibiotic treatments and none are 100% preventable. The best prevention is diligent checking for the symptoms and early treatment. Did I answer your question? I'm not sure--so please respond if I missed your query. Hi there. This is really random, but I wondered if I might be able to interview you about what happens on an average day at the ranch. I'm a romance author and am currently working on a story that takes place at a cattle ranch. And I'm having quite a hard time with it. (I've been a city girl since my family moved away from Southern Illinois when I was seven). I really do feel passionate about this story and the romance bits are going great, but when it comes to describing what they're actually DOING on the ranch, I'm at a bit of a loss. Hey, how is the book coming? I should have asked before Christmas, but I would love to send your book as "New Years" presents!! Elliot, sorry it took me so long to respond to your post! I sometimes feel like I have an adult education school--remember, I am raising five nearly adult kids on the ranch! But seriously, I may be interested in doing something like that--more of a destination/education/vacation location in the future. We'll see how it goes when the kids are gone and I have "more time"--not sure that really happens. Thanks for reading my blog! Quick question , I have heard that during calving season in the colder climates, that the calves sometime have thier tails and ears freeze off. Do you have to wholesale these calves or can you......RETAIL them? p.s. I have been trying to locate you Anderson Cooper link and can't find it anywhere. Boooo, Ron!! Bad joke!! But thanks for reading my blog! :) Check out this link for the Anderson Cooper few seconds of fame for me...http://www.andersoncooper.com/2012/12/13/learn-about-your-food-u-s-farmers-and-ranchers-alliance/ I am especially proud of the fact that they don't ever say my name...I am just a regular rancher. Pretty cool!! we've got 5 acres here, two highland cows... have you ever bred/raised them? Cathy, I have no experience with Highland cattle. But they are beautiful!! What do you do with the calves? Are they bred for meat, milk or fiber? Or all three? Ok, so I spent several hours these past few snow days reading your blog. It is so interesting for this city girl. So, now, this city girl has a stupid question. Every summer I see my neighbor's sprinkler heads pop up and water their lush green grass. Then on Tuesdays and Fridays their lawn service drops by and mows it and carts away the clippings. Now for my question: could these clippings be collected and made into silage for ranchers? Would it matter if pesticides and fertilizers were used on the grass, or would the fermenting process that it takes to make silage take care of getting rid of these poisons? Lisa!! Thanks for reading my blog in your "spare time!" I appreciate it!! I think your lawn clipping question is a good one. There is actually a company doing just that...they buy or receive clippings from lawn care companies and compost them and then sell them to local farmers to feed their cattle. I don't know if there are any regulations as to what chemicals can or can't be used on the grass previously, but I'm sure that they are on top of that. We do use fertilizer on our hay ground, so I don't think that causes any problems. But we rarely use pesticides and I know that is important on lawns. I know that a whole summer's clippings from all the yards in Manhattan might feed my cowherd for a week or so--so I don't see that as a huge source of nutrition for us. But it would be a perfect feed source for someone with just a few cows, and close to Manhattan (Kansas). We feed about 4 tons of silage a day--that is corn silage and milo silage. Those both have a bit of grain in them, and the grass silage wouldn't have any grain. That is a source of carbohydrates and energy for the cattle. It can be added, of course. Anyway, great question! Thanks for connecting!! How do you feel about movies like Forks over Knives and Food Inc? I have to admit, I haven't seen Forks over Knives, but Food Inc is one that I have taken the time to see. I am pleased to know that people are finally interested in who grows their food--we put so much work and heart into it that it is sad that most people don't really care. Farmers and ranchers really love what they do and believe in the lifestyle as well as the job--because it is so much more than just a job. But I also have to point out that there are many misrepresentations of farms and ranches in that movie. Unfortunately, it was made by non-experts who didn't really care to ask the mainstream farmers and ranchers how they do what they do...much less WHY. It is misconceptions that are perpetuated by movies like that, that made me start blogging. I hope people read my blog to see what it is really like on a ranch. I raise cattle (and grow your beef) because I love it and believe in it. Thanks so much for reading my blog and joining the conversation! That is what blogging is all about for me! Hi! I love your blog. I am a freshman in high school & ever since I was little I've wanted to be a rancher with cows, chickens, horses, etc and that dream has never really gone away. I've never really had experience with farm animals though. I live in PA and I suppose I could get a ranch up here; there's actually more farms and ranches up here then you'd expect. I was also thinking about moving down to Arizona and getting a ranch down there after college. Do you think it would be too difficult for me to start up my own ranch? What do I need to know? How did you do it? Thank you!! Thanks for reading, Valerie!! I appreciate a young lady interested in farming/ranching. Yes, there are many in PA! I actually was born in Ohio and my grandparents were both farmers. My suggestion for you right now...get involved in FFA and/or 4-H! You can experience farming on a small scale and get the connections made for when you want to actually farm/ranch. Also, plan to go to college. There are lots of colleges that offer a type of farming/ranching/agriculture. I graduated from Kansas State University with a degree in Ag Journalism and that degree has really served me well! Make all the connections you can with people who know what they are doing. Ag FFA advisors, professors in college, Extension Agents and Specialists....and other farmers and ranchers. I'm pleased to see the future of ag is bright!! What I want to know is how to get started myself. I'm a Wyoming native, and being a rancher is all I've ever wanted to do, but my family lacked land when I was born. I have a middle income job that's not making me rich, and doesn't make me poor, but I've watched land climb out of sight, and now we're being flooded with new residents due to the oil boom. I feel like this is a lost cause, now that I'm 50. Yeoman, I'm sorry I missed your comment for awhile. It has been very busy around here lately! But I think that it is never too late to follow your dream! I suggest that you connect with a local rancher who might need some weekend or evening help and ask him where to find reasonably priced land in your area. You can learn a lot from these older ranchers, too...I love talking to them about why they do different things and if you can get them going, they will talk your leg off! I know just what you are saying about land prices going crazy. The oil boom in your state is not the only driving force. Land prices are crazy high here, too. We don't have much oil in Kansas, but prices are climbing to crazy levels. We are very lucky to own land that has been in my husband's family for many generations. We have purchased land through the years to add to it, but not much recently as we are priced out of the market. Good luck to you!! Follow your dream!! Hello I don't know if this is still active or not but anyways here goes. I grew up in a very small town but my parents weren't into agriculture of any kind I am 17 and want to raise cattle but have no idea where to start. Do I have to go to college? I don't know if I can make it into a college but if thats what is required I would have to try. Any info on what to do to start raising cattle would be greatly appreciated feeling kind of lost with everything. Thanks in advance! George, I strongly recommend going to college! There are some excellent Animal Science curricula at various universities and I really believe in furthering your education. Also, I suggest that you go to your advisor early on in your college career and ask about finding a local farm or ranch that you can work for part time. You will learn about cattle, earn a little money...but most importantly, make a connection with a farmer or rancher. You can always call them for advice or information in the future. Good luck and if you are struggling with figuring out a college, check out Kansas State University--all five of my kids are K-staters! One has graduated, two are still there, and two will be there in fall of 2014. AWESOME place to learn! I am working on a piece on ranching, and was wondering what you would tell a tenderfoot or a beginner what a rancher truly does. OHHHhhhhhh, boy, Gregory! Where do I begin? My first thought is to tell a beginner that the bottom line is he/she will work harder than they ever thought they could, dream bigger than they ever imagined and love it more every day! It is not nirvana, but there is no lifestyle like farming. It is not for everyone, but it is perfect for my family! I found your blog randomly, but I do have some questions for you ;) I'm a student in ag econ major but without any agricultural background in my life yet...I'm recently interested the beta-agonists used in cattle and plan to do some research work about it. One thing I'm interested in is that if consumers do value beef without additives, then it would be profitable for not feed beta-agonists, the premium that they would like to pay will compensate the the loss of not use additives. Do you think farmers would like to stop using additives if they think consumer would like to pay a premium? Or it doesn't make any sense for farmers? Great question. I am totally supportive of letting the market determine the product. So if the consumer is willing to pay more for a "natural" product, then yes, people will do it. And they are! Very successfully! There are quite a few different programs that sell "never ever" product. They have never had an antibiotics, hormones or beta-agonists. That product is selling for a much higher price and it does well in many areas. But the bulk of the population is more concerned about price. It is selfish to think that everyone can afford to pay more for their food. I think it is right to question the things we are doing. Studies are being done on beta-agonists right now and we are waiting to see how they come out. I think there is still a place for them in the feed, but maybe at a different level or rate. I also think that the natural programs are here to stay. Those people who want it, can pay for it. Those that are more cost conscious, are able to buy safe, nutritious beef at a cheaper price that is conventionally grown. The American market is all about CHOICES! American consumers are used to being able to have many different selections to look at and make their own decisions. That will continue. Where are you in school? My daughter is an Ag Econ graduate from Kansas State University and she works at a major feedyard in eastern Colorado!